Have you ever felt like your life got turned upside down and just dumped out? Like everything you’d been sure of was falling apart? I was in that place a few years ago. My family had spent years helping get a church started. It was beautiful and life changing. But we started realizing we’d been part of unintentionally fostering a culture that led many (including us) down a road of legalism and workaholism. We didn’t know what to do. Then our daughter received a death threat from an old boyfriend. It was her first semester of college. She had to coordinate her route to classes with campus police. It was terrifying. And then my husband lost his job and his integrity was questioned because of someone else’s fraud. And then, just as it seemed like the dust was beginning to settle, things got worse. Our house burned to the ground. It was August and there’d been weeks of triple digit temperatures and drought. And there was a problem with the water pressure for the fire hydrant closest to our house. Which meant that critical minutes ticked by as the fire fighters raced to connect to another one further down the road. Our kitchen looked like a bomb had gone off inside it. The shelves of books we’d collected over two decades were soaked and covered with wet ash and insulation. There was no roof over our daughter’s room. Her door was bizarrely still hanging in the doorway with the tatters of a charred birthday message still taped to the front. Not long before the fire we’d made the agonizing decision to step away from leadership in the church we’d been part of since its earliest days. So. We lost our home, our vocations, our community, and our sense of security in a span of months. There’d been one too many comparisons of our story with Job’s by well meaning people who wanted to encourage us to dust ourselves off and hold onto hope. And God was quiet. Which, to be honest, was fine with me. I didn’t have much to say to him, either. It had started feeling like God was kind of mean. Harsh, unmerciful, vindictive. I didn’t want to do any of the things that had helped me connect with God before. No words came when I tried to pray. I didn’t want to read my Bible. And going to church seemed impossible. Where would we even go anyway? Still, we were surviving somehow—barely stumbling along. Kyle fought with our insurance agency until they corrected a major glitch with our policy. The house got rebuilt. We decided to sell it and make a fresh start in a different part of town. We fought a lot in those days. We were hurt and depressed and shell-shocked. We got counseling. We healed a little. And life went on. But my faith felt broken. A connection with God that had been essential and foundational was strained to the breaking point. The still small voice I’d always relied on didn’t feel quiet. It felt obliterated, shattered, absent. And part of me wanted to just stop hoping it would come back. I tried not believing because it seemed more honest. But I couldn’t. I thought maybe it was because I was too much of a coward to admit the God I’d spent my life loving and relating to and inviting others to know wasn’t real. Until one day I made this tiny decision that changed everything. A friend who’d been there through it all, making me laugh and helping me not give up, invited me to take a day trip to a town about an hour away from Austin. Getting away sounded like just the thing. So I went with her. We got lunch and went to some antique shops. One place had twenty or so of these cool oversized metal panels of various Bible stories and saints that had once hung in an old European chapel. They dated from the early 30s, the eve of the Second World War. One of them leaning against a wall in the back stopped me in my tracks. It was a painting of the story of Jesus healing Jairus’ daughter. She was still ghostly pale to convey just how far gone she’d been. Her father, the disciples, and the others are clearly dumbfounded at what’s just happened. Her mother is awestruck, reaching for her daughter as tears dry on her face. And Jesus is leaning to help the girl up and reunite her with her mother. But the thing that really captured me was Jesus’ face. I couldn’t stop thinking about how gentle and full of compassion his eyes looked. For the first time in a long while, I pictured Jesus doing something other than judging or demanding. Something beyond telling people to get their acts together. I could imagine him doing something more than allowing suffering and being sovereign (or is it complicit?) over it. This image did something in me that trying to make myself pray and going to church hadn’t. It reminded me of something that felt familiar but had gotten lost somehow. This Jesus felt like a long lost friend. The story from the painting is in three of the four gospels. But it’s Mark, the one that’s shortest (and the one most scholars believe is the earliest), that gives it the most time. He describes a crowd like Zilker during ACLfest or the grocery store on Christmas Eve. They’d all showed up because word was starting to get around that Jesus was a teacher and healer and maybe even the Promised One, whatever that meant. So, now, everywhere that Jesus went, sick people and the curious and skeptics and people who just wanted to see someone famous showed up. And Mark says a leader named Jairus waded through the crowd to find him. Because his daughter was dying. Jesus was his last hope. And Jesus, for his part, dropped everything and started weaving his way down the street shoulder to shoulder with a man trying to save the child he loved. On the way, Jesus paused to comfort a woman who’d been sick for twelve long years. She’d been in pain that whole time. She’d been ceremonially unclean for that long, separated from community and unable to worship with her people. She’d spent her last penny on doctors but just kept getting sicker. So when she heard Jesus was in town, she took a chance. And when she touched his clothes, she got well. She knew it instantly—she felt it in her bones. And Jesus felt it, too. He could have gotten mad. He could have criticized her for making him unclean by touching him. But instead, he praised her courage and faith. He celebrated her healing. That’s the Jesus I was starting to remember. A Jesus who heals. Who speaks peace into people’s lives. But the man’s daughter was critical and every minute counted. While Jesus was talking to the woman, people came to tell Jairus that his daughter had died. It was too late. ‘Leave the teacher alone,’ they told him. But Jesus told him not to be afraid. To trust. And he took his closest friends and kept going toward Jairus’ house. When our house caught on fire, I was home getting ready to go out to dinner. My hair was wet from the shower and I hadn’t put on my shoes yet. By the time I saw black smoke pouring into the kitchen and study, all I had time to do was help my in-laws get outside and grab my purse and my dog. Kyle was stuck in rush hour traffic trying to get to us. He called our friend who lived about ten minutes away. And Doug came as quick as he could. I don’t remember him saying a word. He just hugged me. And he was one of literally hundreds of people who dropped everything and just showed up to be with us on that day and the ones to follow. They came to help, which we needed. But mostly they came to be with us. To comfort us. To let us know we weren’t alone. I think that’s what it was like for Jesus to leave the crowd and go with Jairus. He was going to heal the girl, absolutely. But that was only part of it. And when I saw the painting that day, I was remembering that Jesus. The kind of incarnate God who has all the time in the world. And who’s willing to drop everything and come to us. Over the years, I’d lost the forest for the trees. I’d gotten too sure I was right about God. I’d started believing being right about God was the most important thing. And I wanted to help people stay safe but only ended up burdening them with lists and rules and too many external authorities. Then I got overwhelmed by suffering. And the truth is that some of the church that claimed to embody Jesus and communicate his message had deeply wounded my family and me and others that I cared about. I learned there are those who use the Bible and church authority to manipulate and control instead of love and set free. The Jesus I was hearing about in that season always seemed mad or disappointed. And to be honest, on social media and in real life, Jesus and his followers were starting to seem like total jerks. I was discouraged at the battles I saw Christians fighting. I was even sadder to see what was getting ignored and overlooked. I needed to remember a Jesus who took a lifeless girl by the hand and helped her get up. The painting reminded me. The kid was dead. Her parents were trying to come to terms with the fear and terror and anguish of losing a daughter. And everyone thought it was the end. But Jesus invited them to keep hoping. Way back when Moses got to actually see God on the mountain, it says that “God passed in front of him and called out, “God, God, a God of mercy and grace, endlessly patient—so much love, so deeply true—loyal in love for a thousand generations, forgiving iniquity, rebellion, and sin. Still, he doesn’t ignore sin. He holds sons and grandsons responsible for a father’s sins to the third and even fourth generation” (Exodus 34:6-7, the Message). Can you hear it? God is love-love-LOVE and mercy-mercy-MERCY. God is grace and patience. And also…God judges. God absolutely cares about sin and holds people accountable. But the headline is love—love beyond what we can imagine. It’s mercy not just for one or two or twenty generations but for a thousand. And that’s what I started remembering the day I saw that painting. A Jesus who was the kind of person that would stop what he was doing and risk frustrating his friends and a lot of people who had come to see him because love and mercy mattered more. Because he cared about a father’s only daughter. Because his heart broke for a mother who had lost her child. Because the life of some obscure synagogue official’s kid (a girl!) mattered to him. If the rest of the stories of his healings are any indication, he could have healed her from the seaside without changing his plans. All he needed to was to say the word or think the thought or whatever it is a deity does to make things happen. But he went to them. And brought life where death had been. It was all starting to come back to me. So. I drove back a week later and brought the painting home. It’s hanging in my dining room now, an Ebenezer of a time when hope got rekindled in darkness. William Joseph Seymour was the African American pastor and leader of the multiracial Azusa Street Revival. In 1907 he wrote, “The Pentecostal power, when you sum it all up, is just more of God’s love. If it does not bring more of God’s love it is simply a counterfeit.” Yep, that sounds about right to me. **Disclaimers: (1) There’s a reason this painting was for sale in an antique shop and not hanging in a museum. It’s no artistic masterpiece. 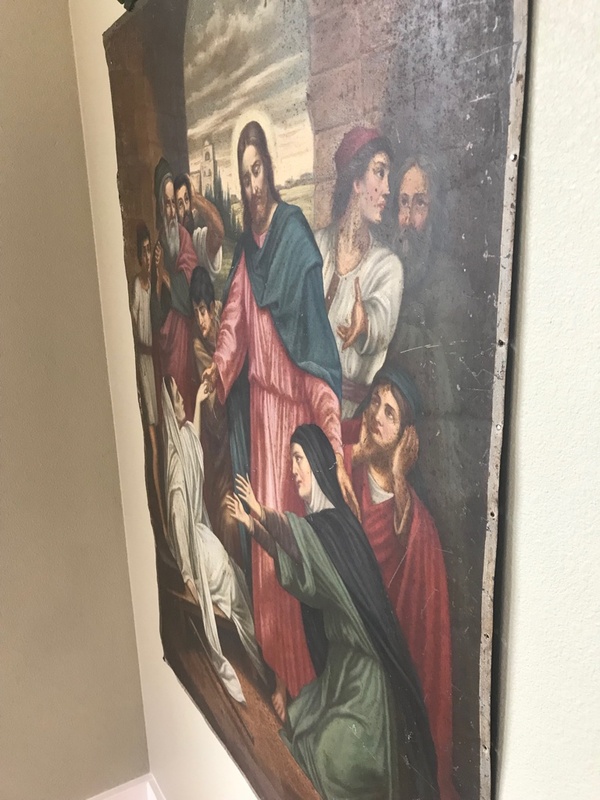 (2) I know that religious art can bring up a complicated set of emotions for folks who grew up in contexts where such images might have been misused. That wasn’t my experience so it met me differently. And, finally, (3) Jesus was not white! The historical Jesus was Middle Eastern and almost certainly had brown skin, dark eyes, and curly hair.